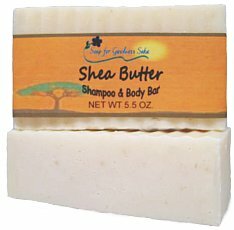 I recently tried a shampoo/body bar and loved it! After years of squeezing shampoo out of a bottle, I’m loving the convenience of having a two-in-one bar. It’s been challenging to find a natural product that is completely toxin free (no sulfates, parabens, etc) and works well with curly hair. Just lather and rinse….leaving your hair feeling really soft and squeaky clean. There are numerous companies and brands out there, but I purchased mine online from Soap for Goodness Sake. They’re recognized as safe by the Environmental Working Group and have signed the Compact for Safe Cosmetics. They’ve got a really great deal going on right now – when you spend $30 you can choose a soap for a penny! Their shipping is also a flat $4.99. Their shampoo/body bars are $6.49, but you can buy sample sizes for $4.00. I highly recommend the Shea Butter bar or Pink Grapefruit. I’ve also tried their Clary natural soap and loved it! The scent is very calming and long-lasting. Check out their site!